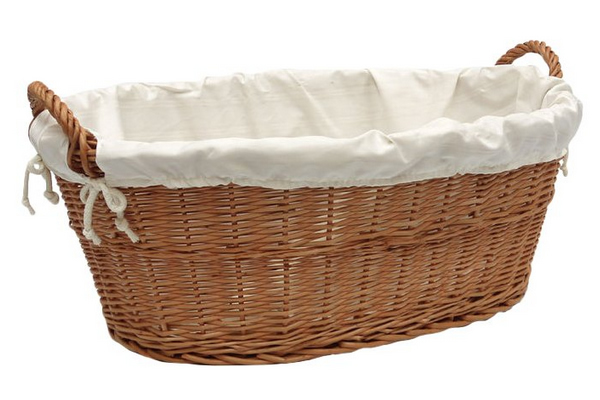 A historic yet timeless laundry basket for the rustic home. 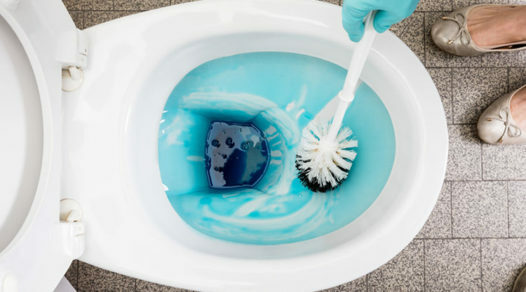 There is often a struggle in home design and décor, where there can be a clash between modern and traditional aesthetics. 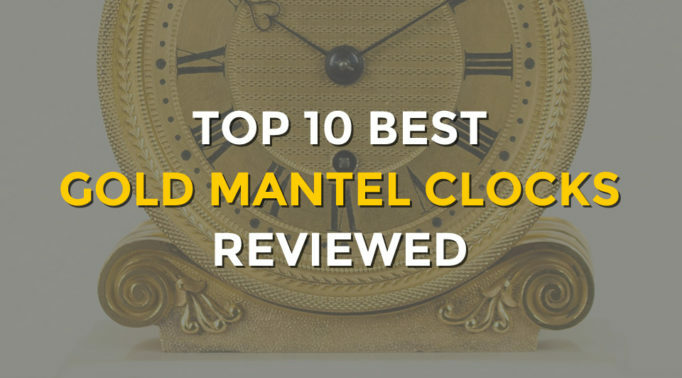 Many accessories and furnishings are designed to suit a modern home with plastics and metal fittings, which is not always compatible with a more rustic home, or those with a softer aesthetic. 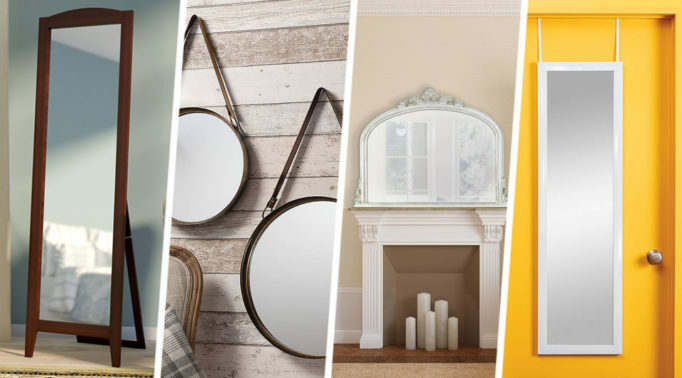 However, there are still a few instances where a home can be decorated with an everyday piece of furniture that gifts a touch of nostalgia and history – one of which is a wicker laundry hamper and basket. Why settle for a soulless plastic laundry bin or an all-too-common metal laundry bin when you can capture the rustic charm and nostalgia of a wicker basket? 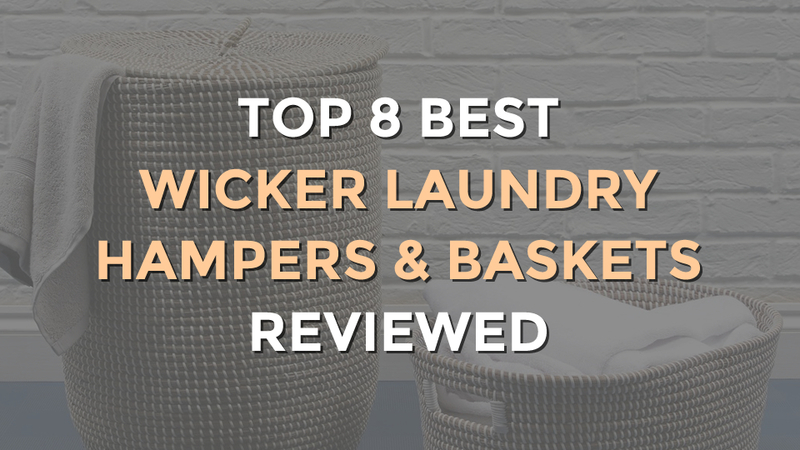 Here are our top 8 best wicker laundry hampers and baskets, all being lightweight, attractive and durable. The term wicker generally refers to the technique used to weave together various cane-like materials, including rattan, willow, reed and bamboo. Wicker products are known for their strength and durability, yet they also have a warmth and beauty to them. 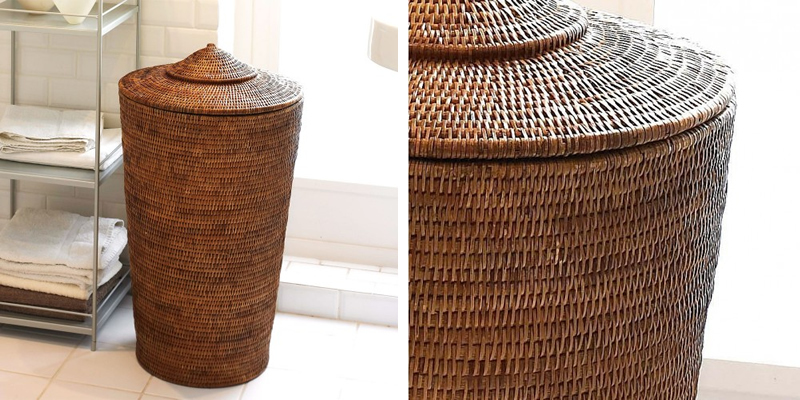 The M&S Water Hyacinth Corner Laundry Hamper is perhaps the most quintessential wicker laundry hamper with a traditional weave. This handmade item is a corner basket, shaped to fit neatly into the corner of a room, which will prove to be perfect for certain room layouts. 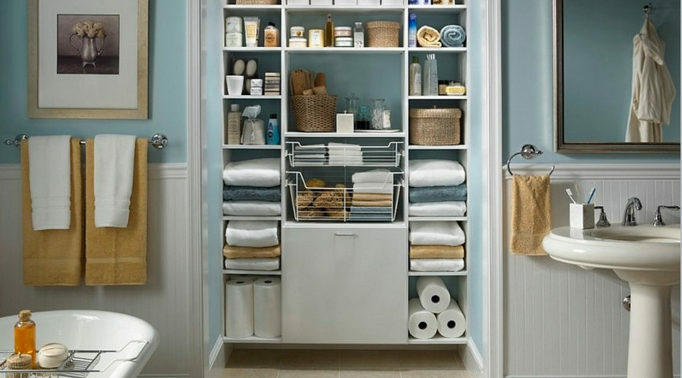 This design makes saving space a lot easier, so the laundry bin is practical as well as traditional. The basket’s height is 60cm, so despite being small in profile, it has plenty of room inside. Though expensive, the Habitat Adder Laundry Basket with Lid catches attention immediately. 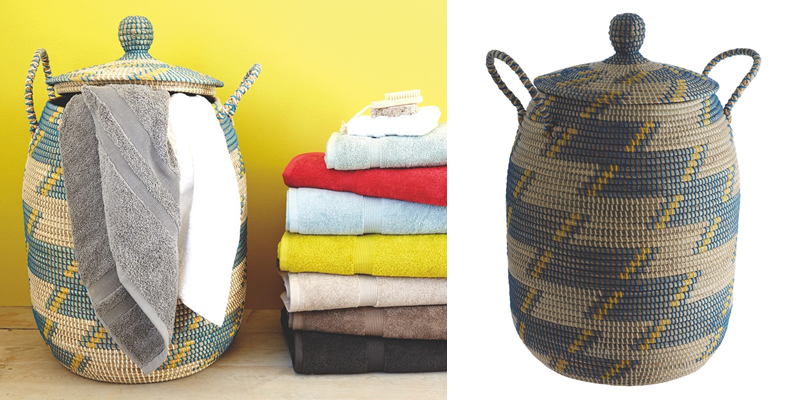 A yellow and blue pattern zigzags throughout the wicker, and the lid embodies a traditional urn shape, giving the entire laundry hamper a unique look. The frame is constructed of seagrass and features large handles, making it easy and comfortable to lift. Standing 68cm tall, the Habitat Adder is a stylish example of wickerwork and it should suit the majority of rooms. Detracting from traditional designs, this is one of the best wicker laundry hamper designs with a little flair to provide a modern touch. For those seeking a traditional arabic laundry hamper, the conical Ali Baba style Orchid Rattan Wicker Laundry Hamper is reminiscent of Arabian Nights and street markets. 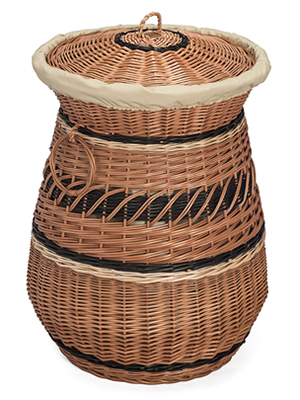 Made of sturdy rattan, this laundry hamper has a dark colouring that will complement light décor. Tightly sealed with a round lid and a vertical weave, this lightweight wicker laundry hamper is lightweight enough to be easily transported and placed anywhere within your home. Standing at a height of 71cm, this beautiful hamper provides plenty of space for storage inside. 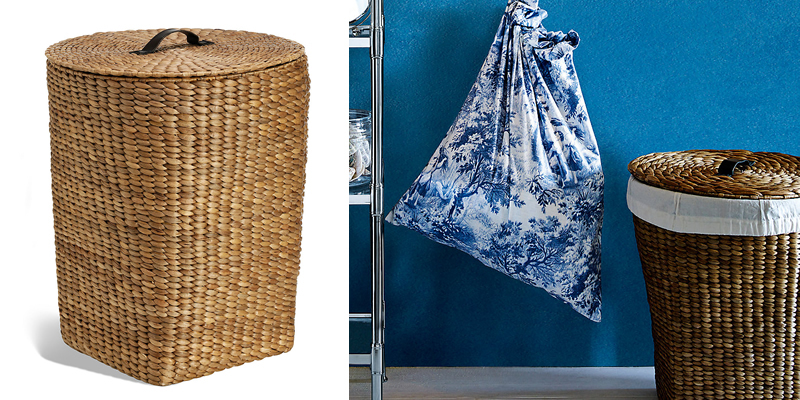 Built with a square base and round lidded top with a simple dark strap handle, the M&S Water Hyacinth Wicker Laundry Hamper projects an unusual form that’s pleasing on the eye and fitting for any rustic and vintage style home. The diagonal weave of the wickerwork gives a pleasing tactile sensation. Measuring 53cm tall and 43.5cm in diameter, it’s a sizeable laundry hamper but not intrusive. There’s even a removable lining within the easy-to-clean handwoven basket. Striking in colours and detail, the Prestige Wicker Laundry Hamper uses several different weaves to create a varied visual effect. It’s made from natural willow that is perfect for allowing the wicker colour and the weave to create a distinct effect. This environmentally friendly hamper has an unusual bell shape, widening out again at the top where the lid sits comfortably inside the rim. While it’s not extremely lightweight at 2.9 kg, there are large rings on the sides for easy carrying. The Prestige Wicker Laundry Hamper is certainly one of the best wicker laundry hampers for lovers of unusual designs and impressive hand craftsmanship. The open topped Kubu Wicker Laundry Basket by Pacific Lifestyle is elegant in design, capturing a truly classic wicker basket design. The wicker has a grey cast to it, which may suit darker or more muted room designs. 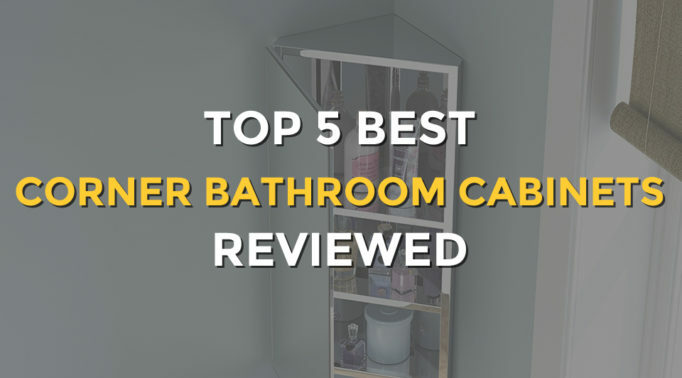 The large sturdy handles at each end adds style and convenience. 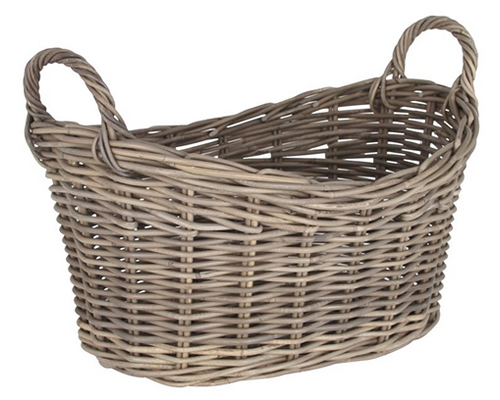 This wicker basket is suitable for much more than just storing and transporting laundry – it can also store and carry toys, towels or any other loose items. Traditional style with a touch of modern, the JVL Hearts Willow Wicker Laundry Basket is one of the best wicker laundry baskets for use with other occasions. The removable and washable canvas lining and a heart-shaped fabric adds charm to the matt white wicker laundry basket. Because of the charming design, this laundry basket can be used for laundry or simply as a decorative storage hamper in any room. Capturing the rustic feeling of a traditional wickerwork, the Prestige Wicker Linen Laundry Basket uses a mixture of supple and strong willow weaves that add texture to the design. 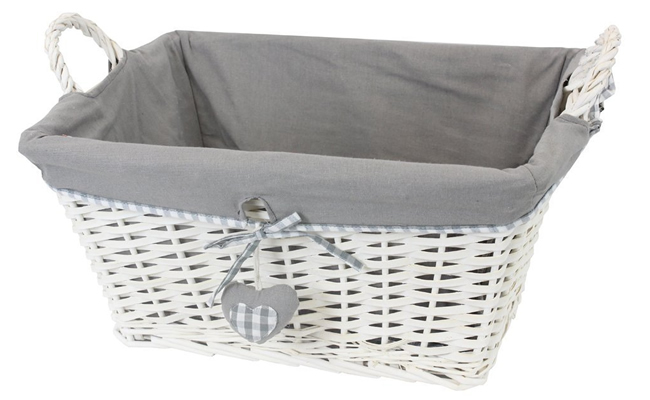 This sturdy basket has short and subtle handles for carrying, while the inner lining is a simple white cloth that integrates a drawstring to tighten and secure the fabric. The Prestige Wicker Linen Laundry Basket conjures up a nostalgic feeling of simpler times that your guests will yearn for. 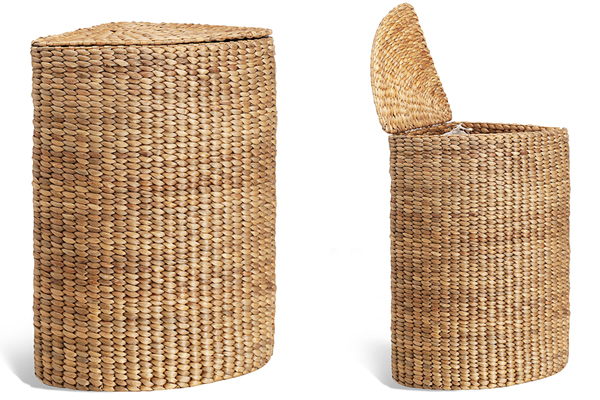 It’s the perfect wicker laundry basket to have sitting around the house.